Here is another page I made for Laura's Scrap Your Stash challenge at 2Peas. I got a little carried away finding new things to do with my old brads, so had to make a second page to use some of them up! And now I have a little tea cup full of repurposed brads to use on future pages, too. A great way to start off the new year of scrapping! I love this photo of my three girls and my nephew Andy. I love that they are each just being their own little person. Addie Blue has a gigantic happy smile, and Ruby Sky is doing that great "what are you talking about?" expression she was so good at, and Summer Lily is perfectly posed and smiling right at the camera, and Andy is just a lovely little laid-back lump. I backed the photo with a piece of Leo, from the Little Boy Blue collection. 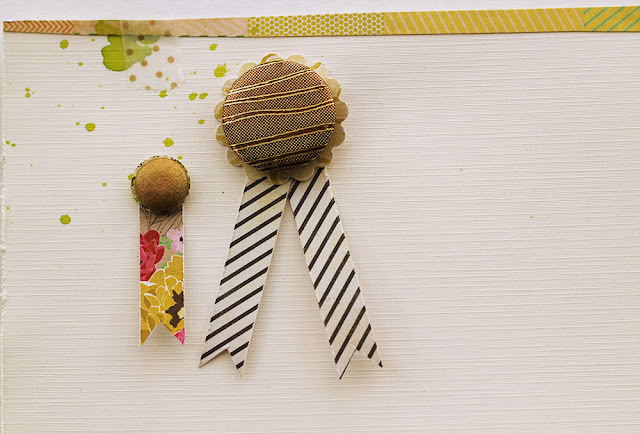 I love the way different paper lines from Crate Paper mix together so easily! 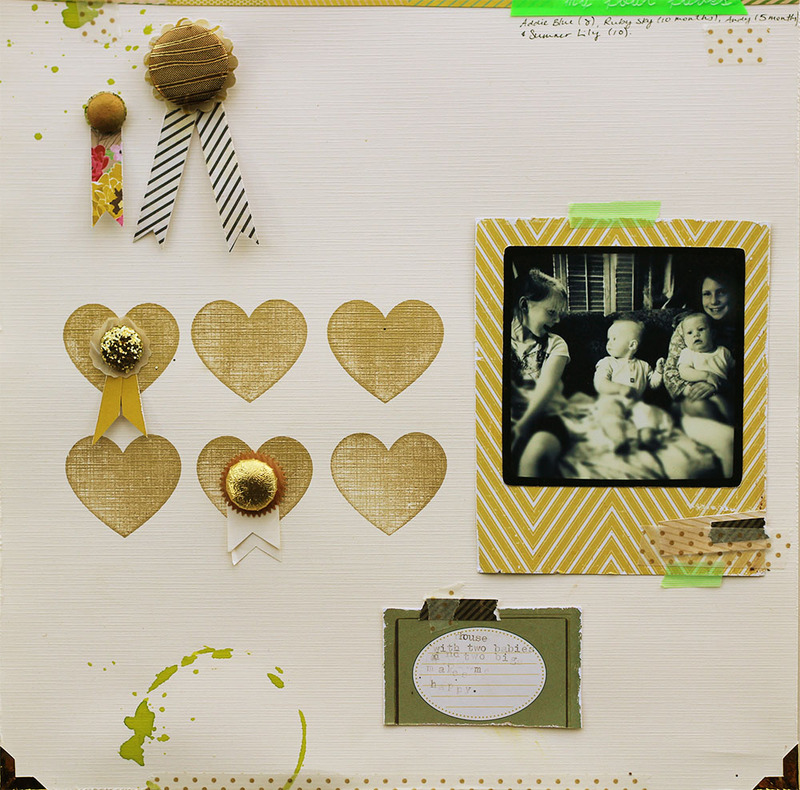 I added gold foil photo corners to the bottom only of the layout, because I like a little asymmetry sometimes. I made more fair ribbons! You know I *heart* a nice little fair ribbon. :) I covered a brad in glitter, and another brad in gold foil. I painted a small fabric brad gold, and wrapped a larger brad in gold woodgrain foil. The tails were all made from the cut-off strips from the On Trend 6x6 pad by Crate Paper. Across the top of the page you can see a thin strip of Cashew Shop paper from Crate Paper's Acorn Avenue. I typed (very messily!) 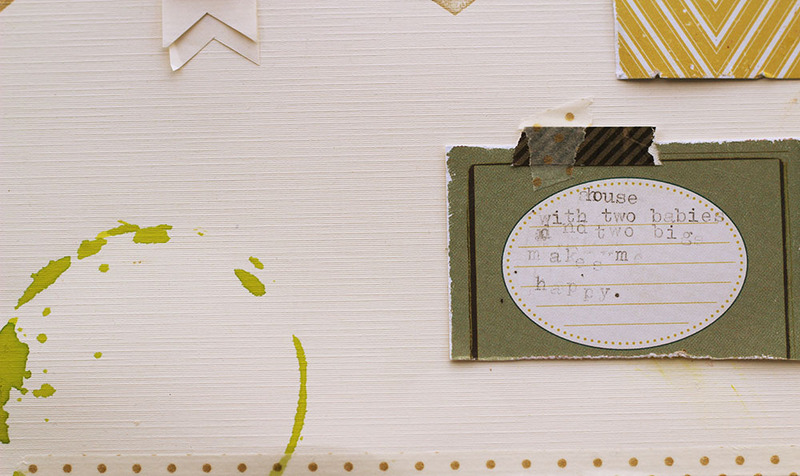 directly onto a journal spot cut from the Acorn Avenue Accent Cuts sheet, also by Crate Paper. I also added a bright green coffee ring and some gold dot washi tape to the bottom of the page. The little piece of brown/black airmail tape across the top of the journalling spot is actually a border from the Story Teller Border Sticker sheet. Super cute layout! 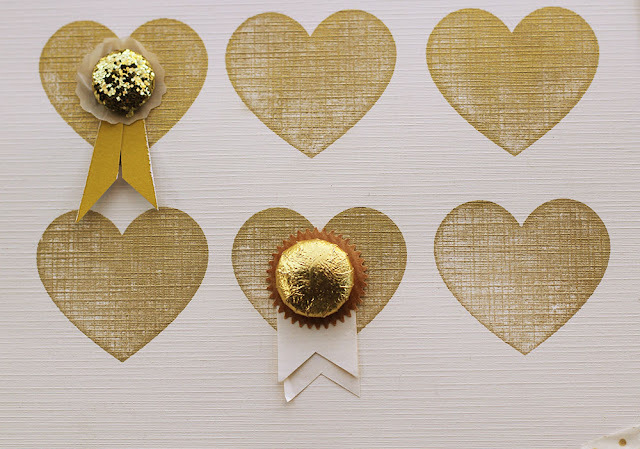 Just loving your touches of gold and how you primped up your brads. Loveliness all the way around! Again, I love your picture so much. I've got to get a coffee ring stamp now asap and love the gold heart repetition.